Isn't this the best traffic ever! And no congestions eighter. I love how birds make nests inside the local traffic lights. I always watch them come and go while I wait my turn. It's a happy little moment for me. I love the colourless colours in this shot - just love the black and white with the glowing light - great shot. A woodpecker woke me up yesterday and again this morning. His methodical peck peck peck had me firstly a little annoyed and then I realised that it was a wonder to be hearing that and I closed my eyes and soaked it in. The sound of traffic is what I used to wake up to. I prefer his natural repetitions. The birds just 'make' the pictures! I would never have thought to do this in black and white but it is so much more effective. I like this ELK! Wonderful analogy for the human condition and commuting. I always love your pairing of words and photography - it's always so uplifting and challenging. Love this! Great way to capture the human condition through nature! I love the bird's eye viewers of the the traffic! 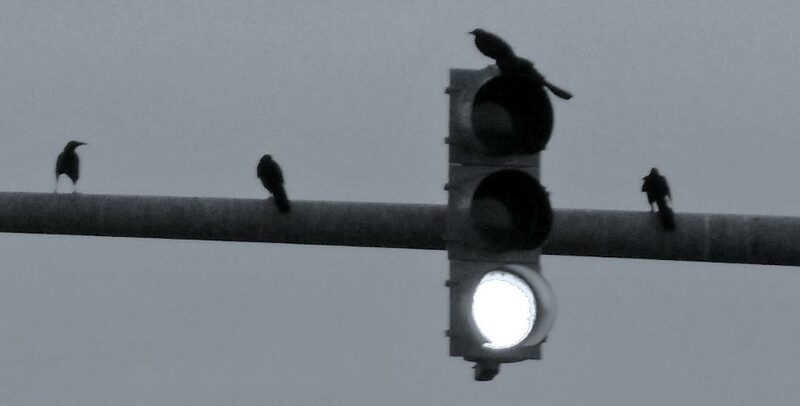 As a hopeless ornithologist, I can say that birds pretty much ignore traffic lights. Just exploring your World...lovely to have found you. I love the birds in flight in the top one. I don't know what it is about birds and traffic lights but they do love them so don't they? In the second one I love the bird on the left - a little bit of abstract happening there. quite a traffic jam :)! i really love that you made these black and white. Great shots! I love them! Oh! I LOVE these :) Wouldn't you love to know how they communicate? I love to watch them flying all around like they are playing together! Absolutely delightful! 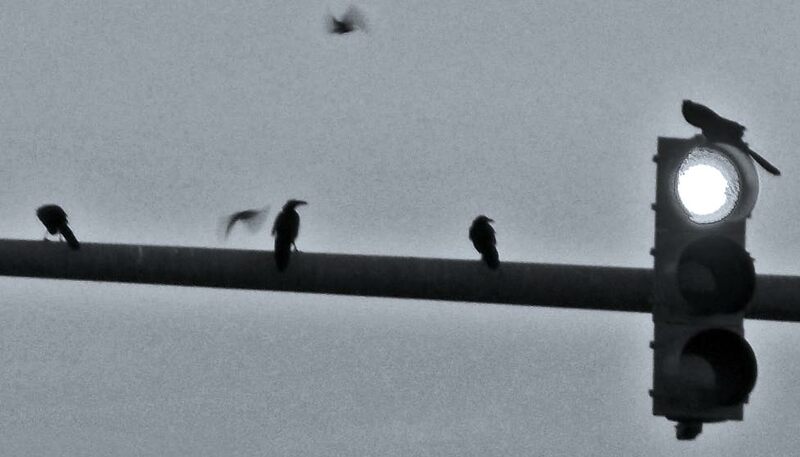 I often notice the birds perched on various rooftops, telephone wires, and lamppost. I really like how you've captured these fellas. Great series. oh how wonderful to be up there instead of stuck in traffic. i wish i was a bird. Loving these pictures of beautiful in the ordinary.